Mumia Abu-Jamal is an American activist and journalist who was sentenced to death for the 1981 murder of a Philadelphia police officer. He has always maintained his innocence and many liberal groups continue to criticize the lack of fairness in his trial and see it as politically motivated. While on death row, he has become an influential author on social and political issues. After 30 years on death row, his death penalty sentence was dropped in 2011, and he was re-sentenced to life in prison. 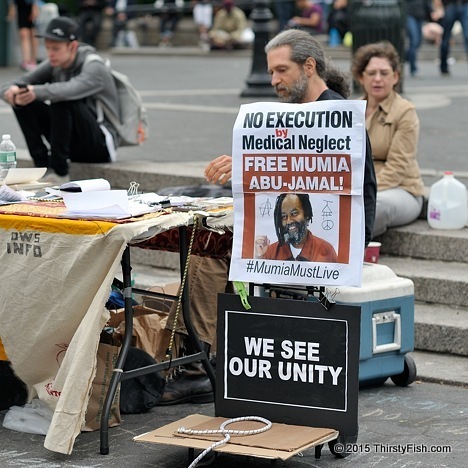 More recently, activist groups are claiming that Mumia is receiving inadequate and detrimental treatment for his diabetic condition. They are calling it "execution by medical neglect". A few weeks ago, FBI have formally acknowledged that "nearly every examiner in an elite FBI forensic unit gave flawed testimony in almost all trials in which they offered evidence against criminal defendants over more than a two-decade period before 2000". And "in 95 percent of an examined 268 trials, FBI Laboratories overstated forensic matches in ways that favored prosecutors that included the cases of 32 defendants sentenced to death". It is also no longer a secret that law enforcement and the FBI, under programs like COINTELPRO target and frame politically active groups and individuals whom thet deem to be "subversive". I am in no position to hold an opinion on the guilt or innocence of Mumia Abu-Jamal. As far as I'm concerned, the fact that Law Enforcement Agencies in the United States are already "proven" to have intimidated innocent people, framed political activists, forged forensic evidence, shot unarmed citizens, falsified reports and denied medical care to prisoners, is sufficient cause to be skeptical of "Law" Enforcement. And most recent events in the news indicate that, rather than correct the problems, we are trending in the wrong direction, possibly toward a police state.